SWEET!!!!!!! > can't wait to hear it. 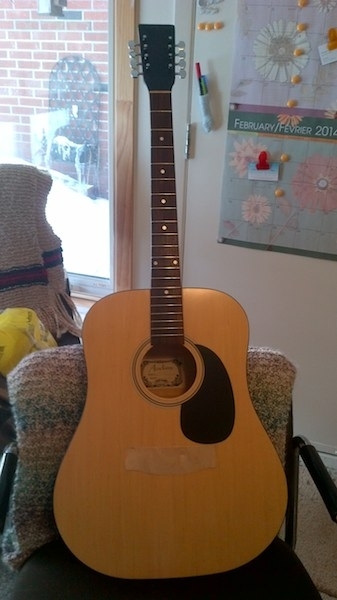 I'M Back ... a couple of pictures to show some progress, Have narrowed the neck by about twice the thickness of the binding on each side, Filled all the tuner and screw holes in the head stock ready for re-drilling. 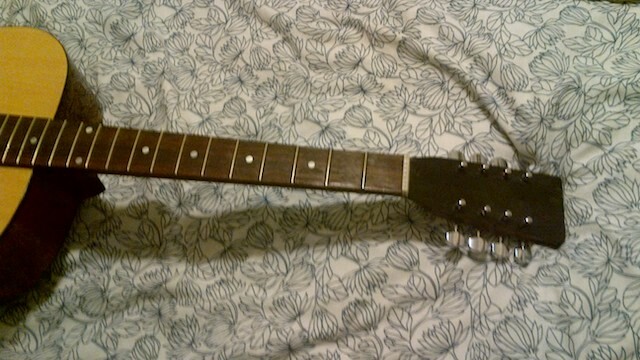 I plan to remove all the mahogany lacquer from the base of the neck to the end of the headstock. I will thin the headstock to allow a birch veneer both sides of the headstock then a dark stain on the bare wood and probably a coat of varithane. 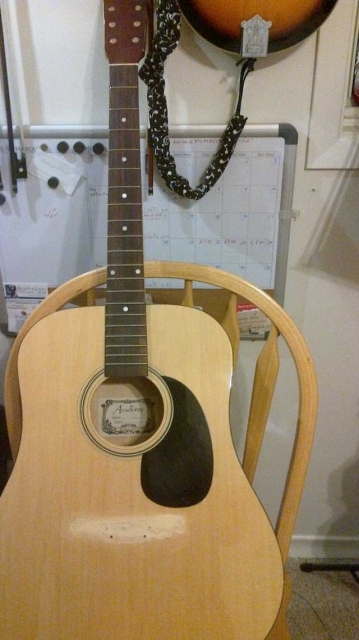 Still shopping for a 12 string acoustic bridge and saddle (frugality rules) and a 1.5 inch nut. Probably a big wait now till after Christmas. Merry Christmas BTW. Are any of these your posts Ray? They seem to upload fine. Hello Pierre; Thanks for looking in. Yes they are my pictures and I dont know why they didn't post into the text but they are available in the list of attachments and come up when clicked. I will check my process when I post next set of pictures. I agree that the upload pictures process is a little strange here. Hopefully something that can be improved on but let me know if you can't figure out a way to get it to work for you and I'll investigate a bit more. Decided to inlay some birch veneer. 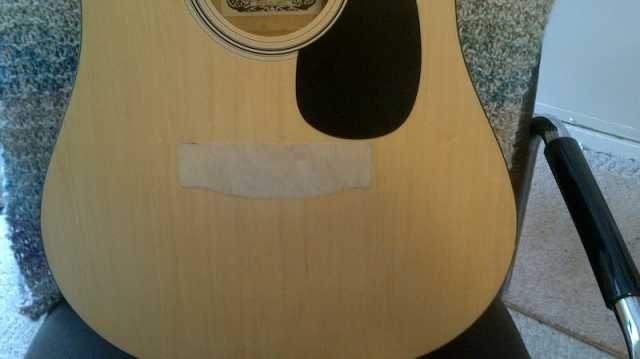 Still looks repaired but perhaps not ugly. The insert stands fingernail proud of the rest of the top but I don't have skills to get it closer without messing up the rest of the top so have left it a bit high. 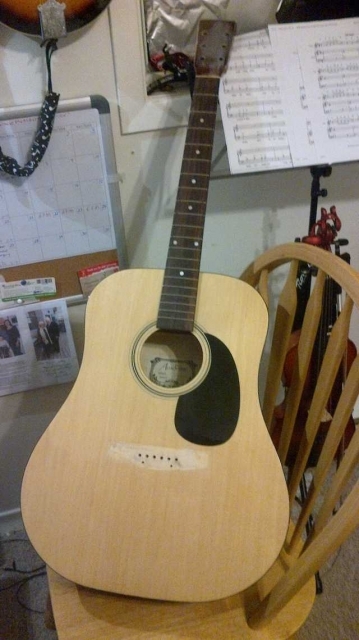 And have applied a mist coat of satin polyurethane to the top of the instrument. I am back with a picture of my mandofamily. 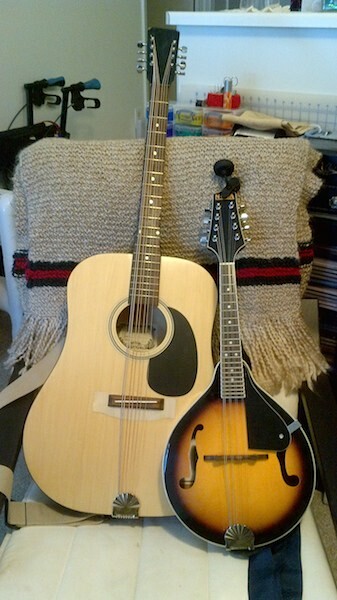 You can see my mandolin and the big fella is the Guitar to Mandocello conversion as 15 March. 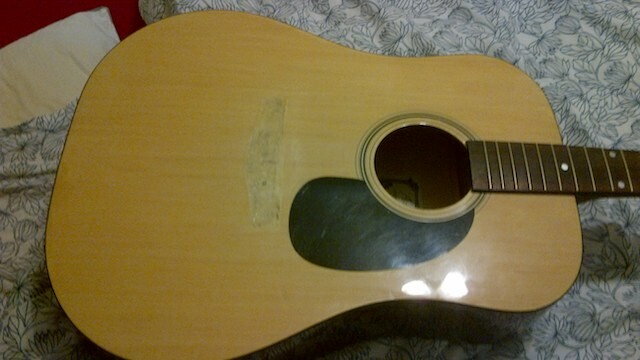 I have fitted scallop shell tailpieces to both instruments to solve the problem of covers coming off. 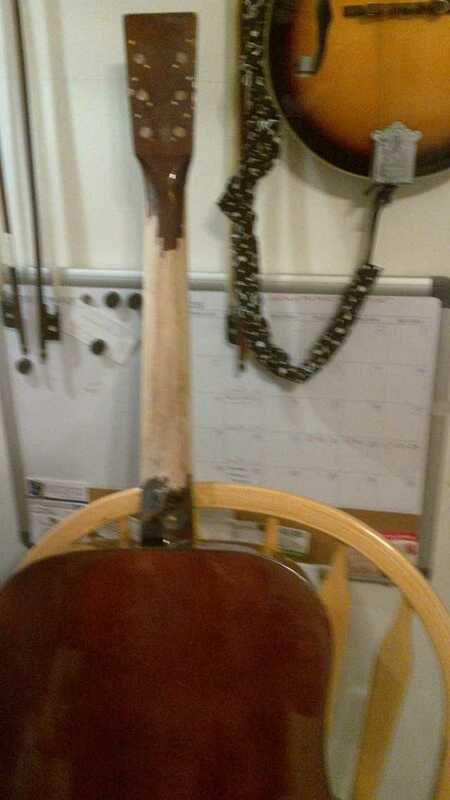 A lot of difference horsing the big fella around compared to the Mandolin. 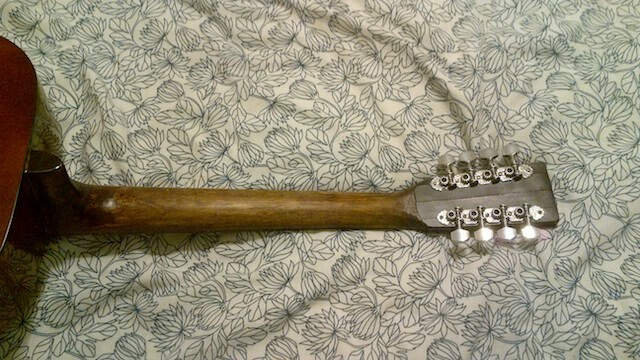 Mandolin is almost casual to play but the Mcello requires more deliberate action or probably I am just not used to it. The family are looking good. The scallop shell looks great.